We broke the news that it was still possible to load your Amex Serve account using a Visa, Mastercard, or Discover back on April 22. American Express had set a shutoff date of April 15 for credit card loads other than those on the Amex network. 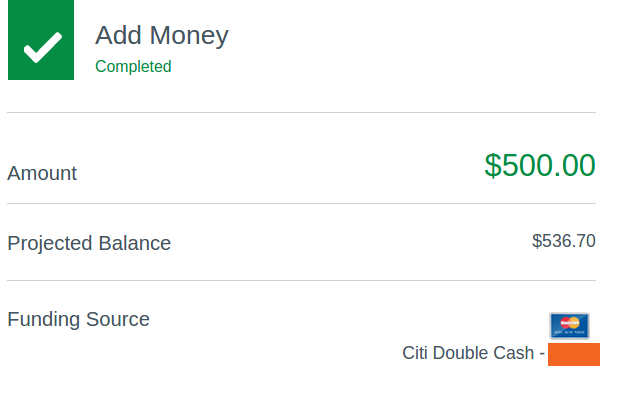 We just confirmed that it is still working for the month of May, my $500 load was successful using my Citi Double Cash card. The only caveat is that your old credit card has to be saved to your account before the shutoff date. This may also be limited to those people who signed up through Softcard. After you click on "Add Money", simply find the "Change Source" link to switch to your credit card. If you don't know what Serve is, it's basically a free $20 or $30 every month for 5 minutes of work. The loads count as a purchase for cashback reward purposes. If you are new to Serve, you can still get the rewards by using a card on the Amex network like the Fidelity Amex.